7. Turn on main fuel fire valve and set main flame. This flame burns continuously, there is no provision for a pilot. 8. Let steam build and lightly run engine. This will replenish automatically water and fuel. 9. Boiler safety valve is set at 610psi. 10. To progress gently move cut off lever and PRAY. This cut off lever can also be used for emergency stops as it totally excludes steam admission to engine. Also there is a handlebar controlled steam dump valve link to the top of the safety valve. 11. 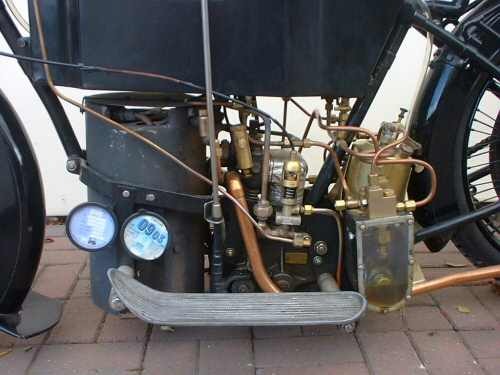 Steam to engine is controlled by handlebar lever control. 12. Brakes are fitted as per era?? 13. Check your maintenance software to make sure no other issues need to be addressed. developing 8HP, with poppet valves and a 180º crank shaft. The inlet opening valve from 0-75%. The machine will go practically anywhere on a 13% cut off. 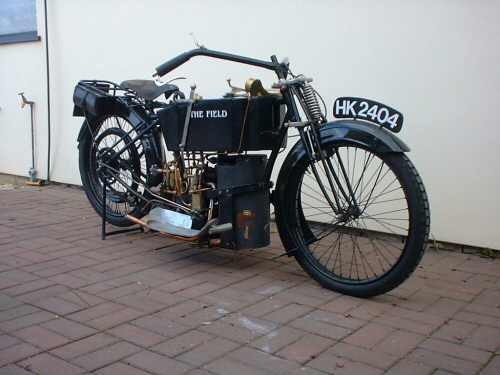 The engine has cast iron pistons, Babbit metal big end and bronze main bearings. Variable lift sliding camshaft operated from top of tank.